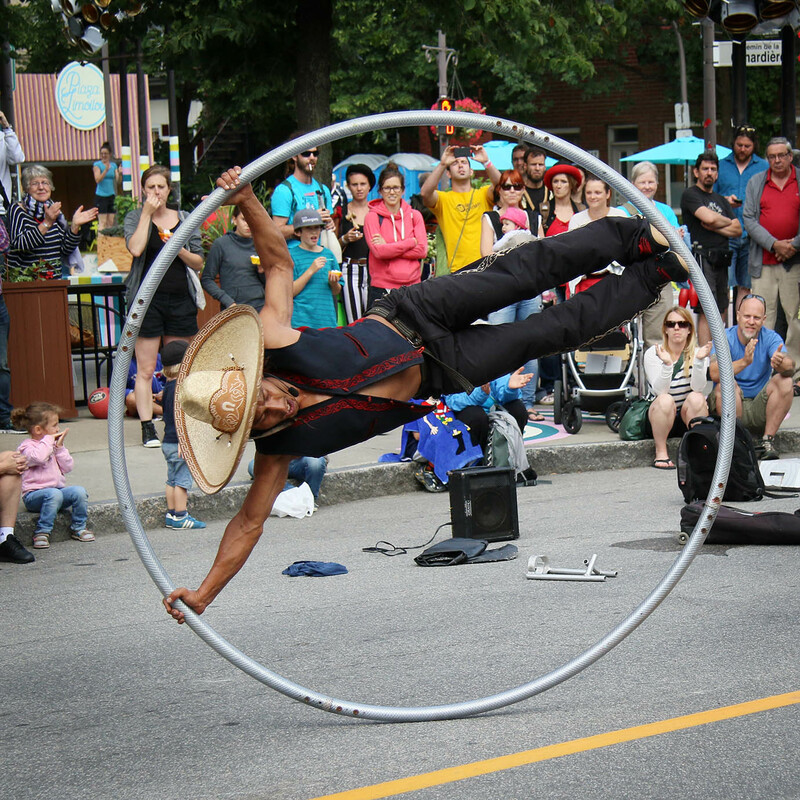 Contemporary circus, Canadian scenery, and serene climate made Quebec City a star location for the 68th Annual IJA Festival. 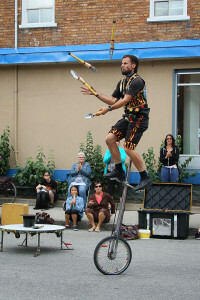 Though only some of the festival transpired at L’Ecole de Cirque, known to many jugglers as home of the Turbo Festival, the creative atmosphere infused the spirit of the art. The college gymnasium of Cegep Limoileu housed most of the open juggling and nary an off spot could be found on the ultra-bouncy floor. Stage competitions and shows took place at the Imperial Bell Theatre, a vaudeville era classic with MCs either from the Quebec school or out of the history books. 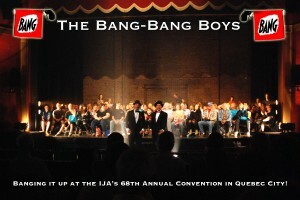 Special shows and workshops have become a regular feature of the IJA. 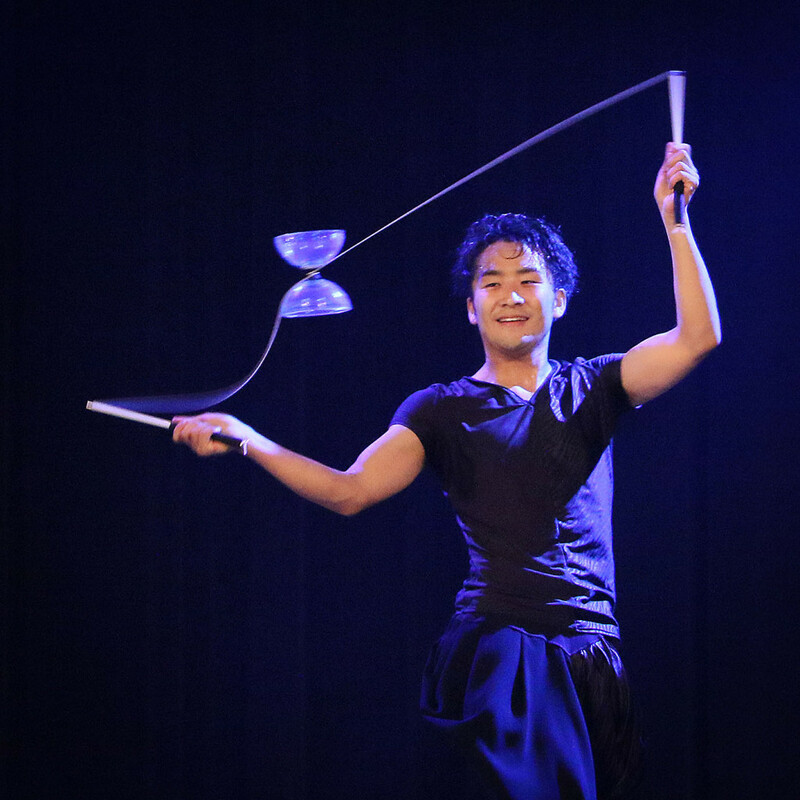 Jugglers gave Flip FabriQue and Machine de Cirque many thumbs up for melding innovative passing patterns with hooping, aerial skills, and performance character. 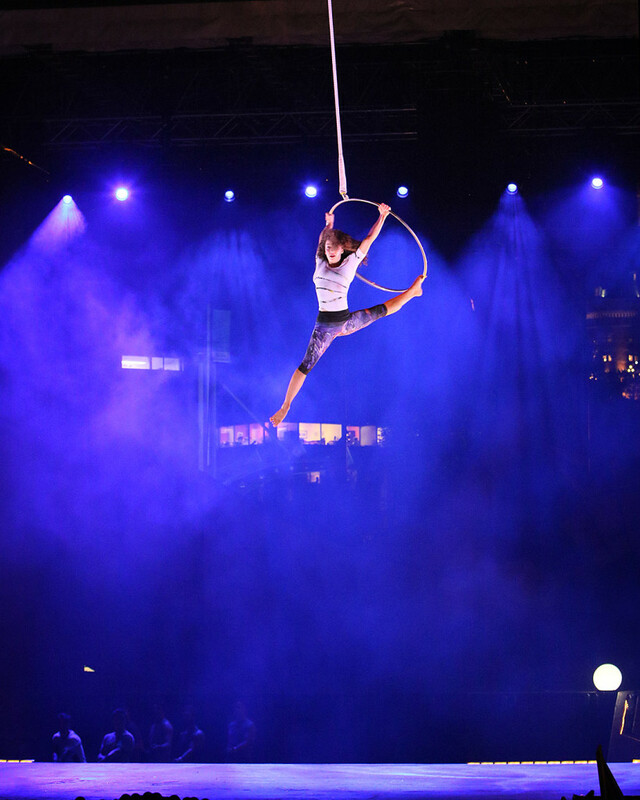 Flip FabriQue presented for the city at Agora du Port de Quebec throughout the summer. Crepuscule contained ensemble drama and sheer fun. 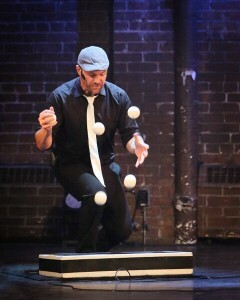 Teeterboard flips into a pit of black and white balls in which the performer disappeared made an irresistible treat. Club passers Francis Julien, Jérémie Arsenault, William Poliquin-Simms, Jérémie St-Jean Picard, Christophe Hamel, Bruno Gagnon worked in formation with a character slant and the contemporary hula hooper was lifted in meaningful manner and ultimately leapt off the stage. 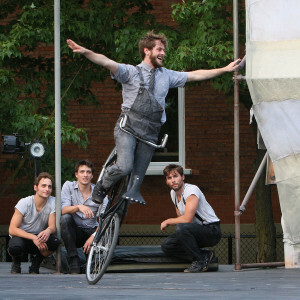 The 5-person Machine de Cirque took the role of Welcome Show at an outdoor stage set-up downtown. 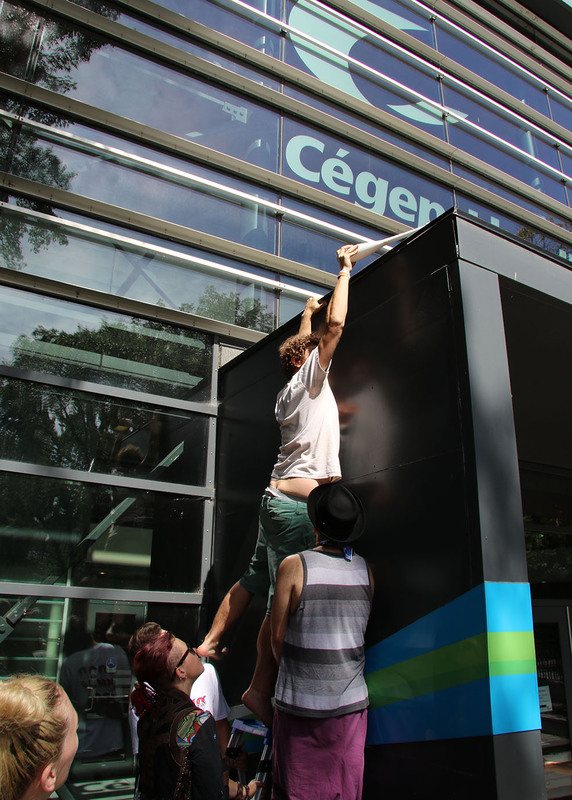 With rugged ingenuity based on a survival concept they teamed on teeterboard, bikes, and acrobatics with some 5-club patterns and passing thrown in. 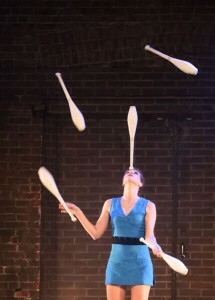 A particular favorite for the jugglers was the lying-down club passing formation in various feed patterns. The IJA also hosted a Welcome Stage redux giving individuals a chance to perform and a benefit show at Theatre de la Bordee. 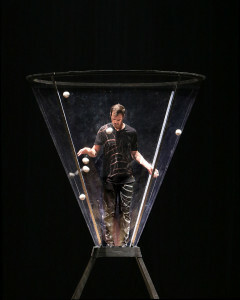 Greg Kennedy and Co. presented Theorem, a special performance at L’Ecole de Cirque on Thursday night. The “hemisphere” from Kennedy’s championship act in 1996 made an appearance, sans croutons, as did an updated Lucas Cup for Kennedy and his family to take home. 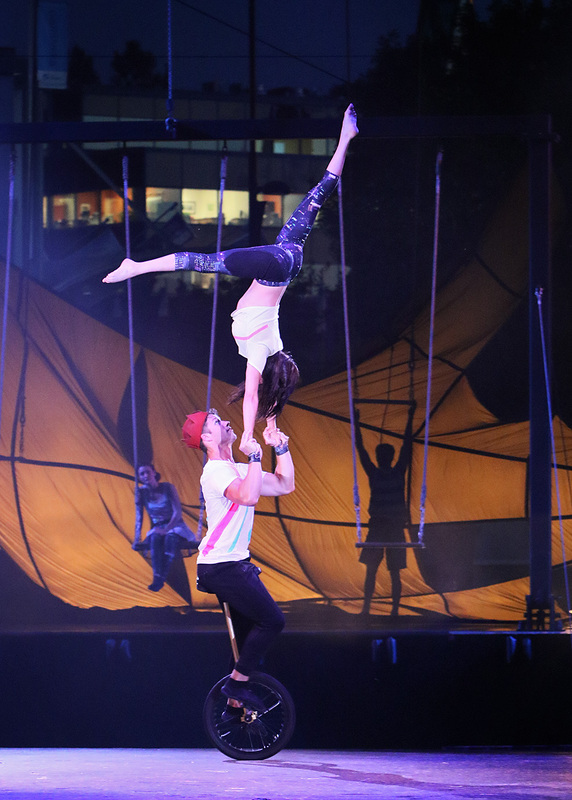 Greg and aerialist Shana Kennedy manage a circus studio in Philadelphia so they enjoyed the familiar scene, as did their three young enthusiasts. 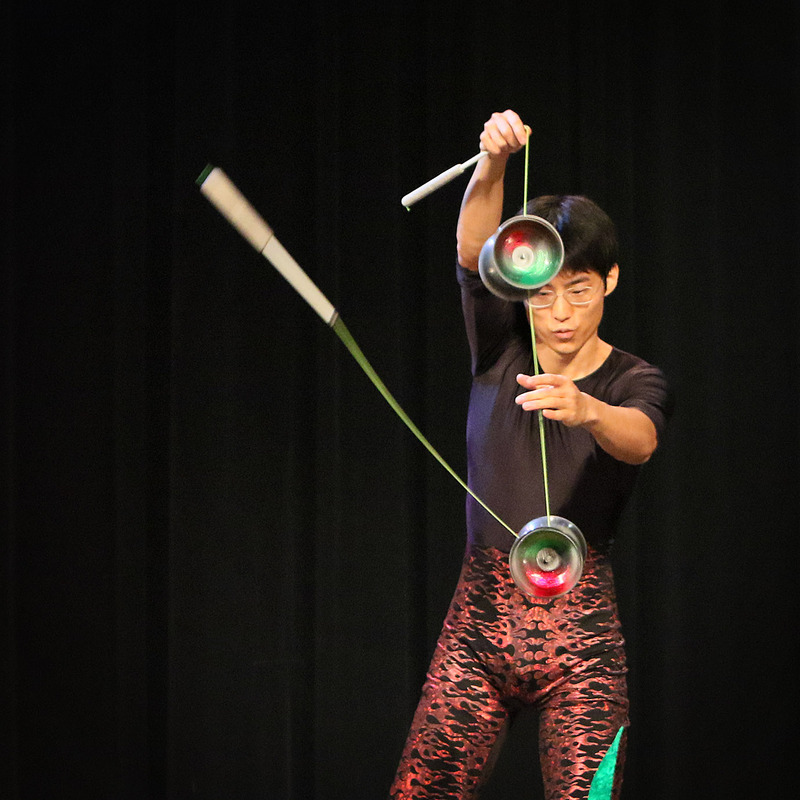 Theorem has been pursuing touring opportunities in the wider world of performing arts centers, but here jugglers could apply their own musings to Kennedy’s ideas and innovations. They could also take the Special Workshop during the week. 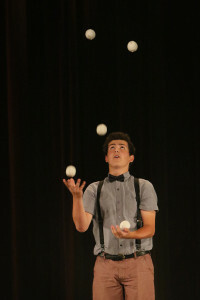 Kennedy is such a skilled all-around juggler not many can keep up and most of his collaborators have other specialties. Zack Delong, Shane Miclan, Christine Morano, Nicelle Burgio, and Matt Scarborough tossed in batches of beanbags until the ultimate batch fell from the ceiling. This worked better than the piñata at Renegade. The piece comes alive when Kennedy gives each performer a magic sphere igniting their childlike wonder. This leads nicely into a group box build as an adroitly fashioned tower interlocks en balance. A triple hemisphere emerged successfully with a wonderful trio of practitioners rolling six balls each in legitimate patterns. Kennedy follows with an eight ball solo. 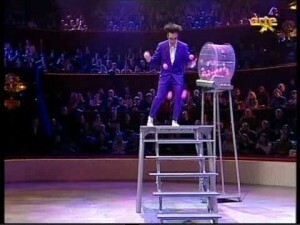 What happens when one performer gets all the balls is best answered in the DVD. 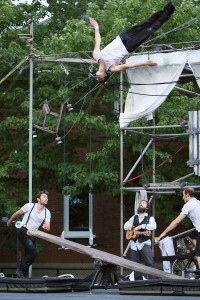 Moving en l’air, an aerial double cloud swing impressed with a strong hand-to-hand sequence and evident performance enjoyment. Three silver balls on strings created a larger ensemble with possibilities. Maybe there’s a way to add poi capabilities. The Moschenesque performance of the square in circle yields its own patterns. One of the differentiations is the ability of the square to rotate in a circle and produce new angles. The idea of performing this way might have echoed Moschen more than any particular trick; it is the way of contemporary circus. Invigorating set patterns led to a Ferris wheel delight. Vaudeville performers traditionally utilized some of these techniques, though Kennedy’s contraptions have advanced from the typical box or park bench a la Bobby May. Willow (giant wand sculpture) entertained and intrigued the jugglers with the equivalent of a 5-wand cascade. Kennedy figured out a teepee of complexity as we watched secrets of the universe unfold. A geometric study par excellence continued with the ceiling experts hanging from a diamond configuration. Then came the double cane shapes, still evolving since it’s a new form. Maybe hanging from an apparatus on the “hook” of the cane would tie it together. “Orthogonal” offers advanced fun as balls bounce off a V shape. If only they had this at airports we would all still be there. The pianist, whose accompaniment resonated effectively throughout, turned conductor for a prop makers’ glockenspiel. Plastic tubes created a visual cascade as performers played them off the floor in a line. As for the anti-gravity chamber, I have a theory that it is enjoyable to practice. If you tried the Gandini cube you would also want to try rolling balls inside a giant clear plastic cylinder. Kennedy’s creation looks pretty contemporary if not cool. Theorem proves the Lucas Cup was only the beginning, if not passé. With the outdoor settings so appealing, the Buskers’ Competition fit naturally. Former busking champ Bekah Smith Hammond, back as a judge, noted the evolution of the event. “Lots of great acts, each unique. Geoff Marsh (Gypsy Geoff) did a lot of hard work putting it together and it really showed. There was a lot of support from the general public.” Busking has moved into the modern age as Pancho Libre (aka Fransciso Sandoval) spun to first place with a Cyr wheel and a sombrero. 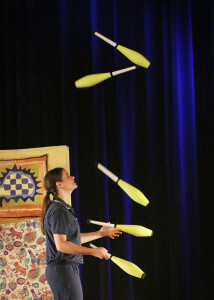 Juggler Sokphea Mackay did not know she would be taken for a ride, but competitors could count on coordinated volunteers. Noted second place winners in the contest were Jorge Petit and Franklin Luy as Devenchi. Propmakers from Henry’s of Germany to Higgins Brothers of Canada displayed more than the usual items. My son, Theo, enjoyed the mini-diabolo that fits in a school sack. 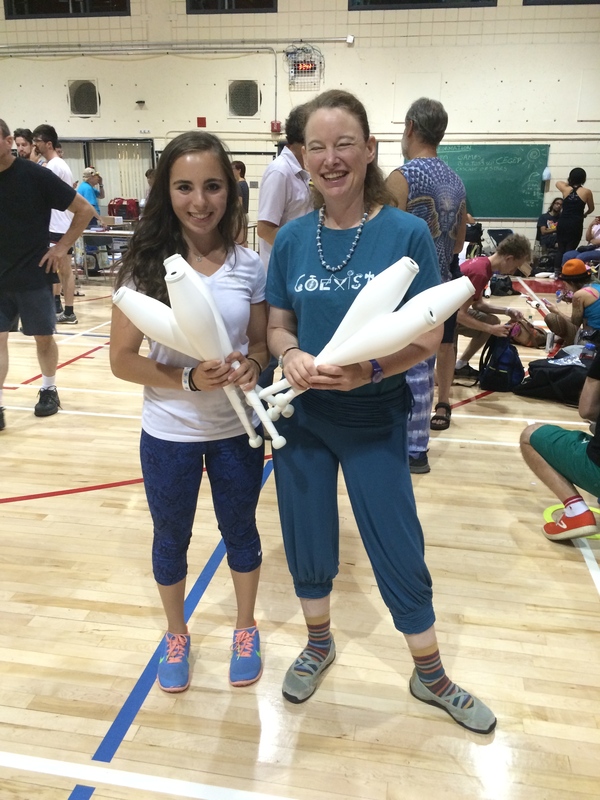 Pirouettes seemed a popular club with the circus school crowd and with the Flamingo Award recipient, Sophia Rosman. Her father, Michael Rosman, accepted the honor on her behalf as she departed for gigs and college. 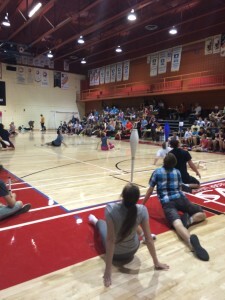 The best “floor show” took place in the juggling hall. 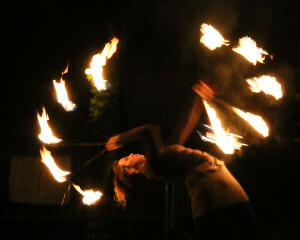 Vulcan kept the nightly glow poi jams going late. Nick Laffey took three-club work into the future with innovative and impressive tricks that seemed to gravitate 360 whether the clubs spun like propellers or off his head. Clockwork, Jack Kalvan and Rick Rubenstein, reunited for club passing. 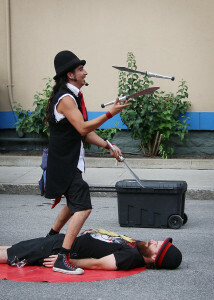 Perennial IJA photographer Joyce Howard caught the old walled city of Quebec and groups sporting the blue 2015 IJA T-shirt avec juggling unicyclist. Even videographer Jay Ko got into the act juggling on a Solowheel. Emile Carey, known for his creative routines such as the mad scientist, enjoyed a reunion at the festival: “For performers it’s hard to come to the festivals because you have to pass on work, so when it comes, I do it. For me, it’s a big thing because I have a history with the IJA,” he said, speaking for many. “It’s my first in ten years and many remember. 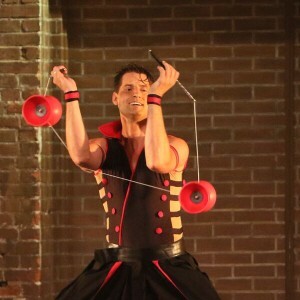 You feel like you touched a lot of people in a few competitions or shows.” Carey competed at the IJA in Buffalo, NY, and lives near Montreal with his family. It’s not every year the IJA is associated with a circus school. This year the genre infiltrated the show with diversity of skills and presentations. Andrea said, “in our school we have a lot of different people from a lot of places. We want to have some locals who are good artists.” Outside the historic building a fire show by VestaFire Entertainment of Vancouver and associated artists pleased spectators. 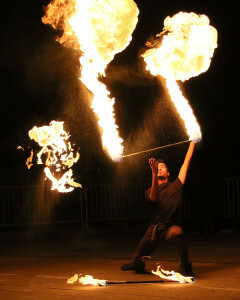 Jenna Strong, 9, described the techniques as her mother, Karina Strong, spun center with the troupe’s hoops, wands, stilts and torches. Other events taking place at the Quebec school included Club Renegade and Numbers. Richard Hartnell had just the right approach as host of the late-night shows, providing kudos, rescues, and humor at all hours. A jazz band accompanied those willing to take the pioneering plunge. This could result in a mobile cardboard box tower, a plunger fiasco, or a potential for excellence. A Chilean trio gave the effect of improvisational ball passing in captivating configurations a bit like capoeira. 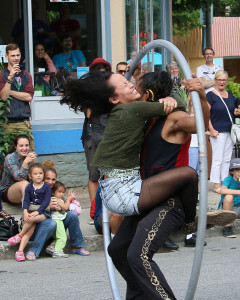 The hoop rolling partners Evelyne Laforest and Stephane Gentilini displayed a verging-on-contemporary hoop-rolling sequence based on the vaudeville technique. Laforest combined her acrobatic skills to make foot catches and Gentilini provided the base hoop rolling extended in some new directions. 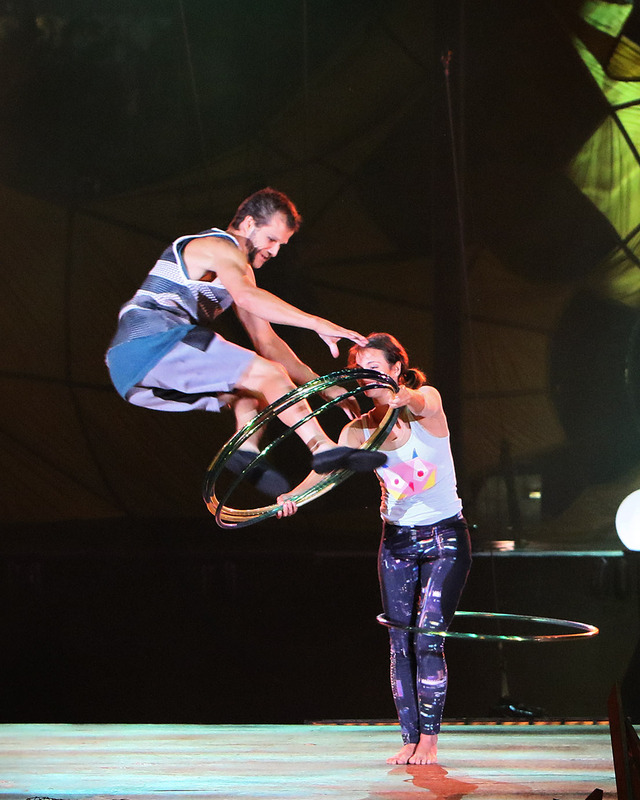 They also passed hoops back-to-back and brought together technique with artistry in grand yet spontaneous Renegade fashion. Geoff Marsh performed with mouth stick and signature hat. X-Juggling continued to cross boundaries and gain adherents with new medals, the result of some extreme pewter melting in the Kalvan kitchen. Delaney and Benton went head to head and Jonah won too many events, prompting new rules. Normally competitors take turns trying to nail gnarly and original tricks to power music though this year included some fanciful headgear. 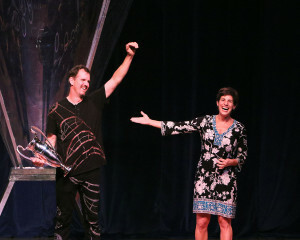 X-Juggling originator Jack Kalvan performs with his wife Jeri on stage and screen in L.A. They also organize a practice studio. 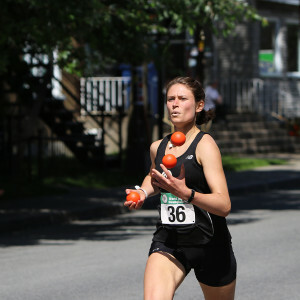 Gabrielle Foran began joggling when she was getting her Masters in Chemistry. Now she is in the running for a PhD; and sweeping the Women’s Open joggling awards! Foran exhibits good form in a sport that can entice a haphazard confluence of skills. Thinking about a thesis leaves one doing three things at once, yet Foran set the road-race record in the 1600 meter 3-ball. 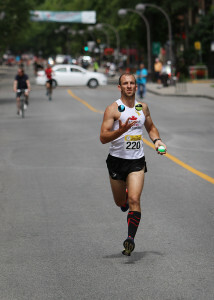 In the Men’s Open, Michael-Lucien Bergeron led the field winning gold in the 400, 800, and 1600 meter races. Numbers competitions saw some records and a growing categories like ball bounce ensemble passing. Matan Presberg achieved first place with a nine-ball start he thought might be based on Dave Ferman’s. Matan has been working on nine just over a year and can do up to 48 catches. He has been known to perform at school. 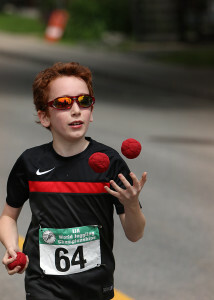 His Dad juggles but Matan learned at a kite fest. Maybe we should all take up kite flying. 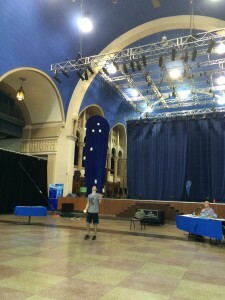 Christian Kloc took first place in his specialty, ball bouncing, completing 34 catches with a nine-ball bounce. Merry Spahr, the IJA’s first Numbers female champ (3-person club passing) lent a hand to the panel, which also included the Cain brothers. 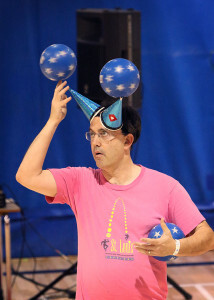 Jugglers could try for their own records in the Games of the IJA, coordinated by Jean-Felix Belanger. Special Workshops were organized by Benoit Duinat and Alexandre Seim. Shows Director Andreanne Lafleur Caouette of the Quebec school was happy to have an experienced competition team from last year. 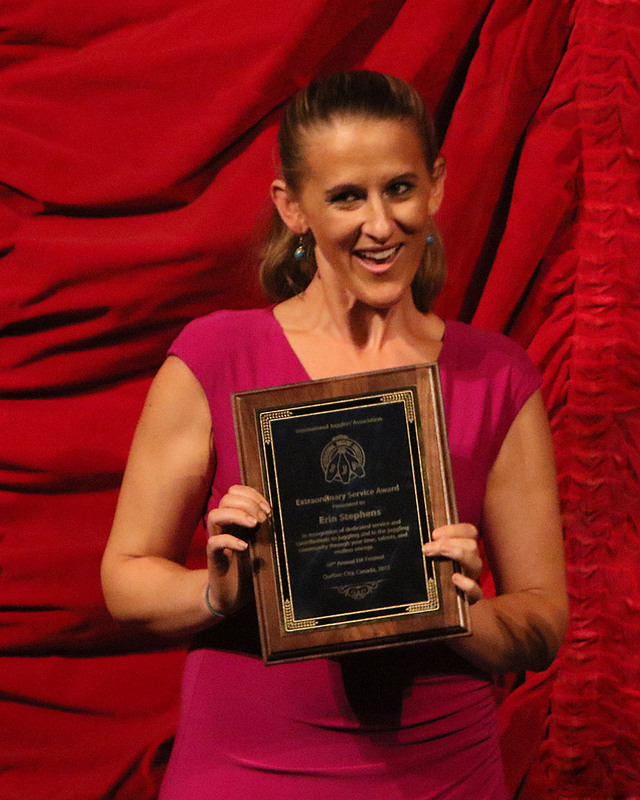 Viveca Gardiner served as Championships Director on stage and off. Keeping up with the evolving scoring systems and qualifications requires a form of “raquette science.” Judges also brought diversity of talent: Greg Kennedy, Galen Harp, Svetlana Zueva, Ross Berenson, Erin Stephens, Mark Hayward, and Yohann Trepanier comprised the panel. 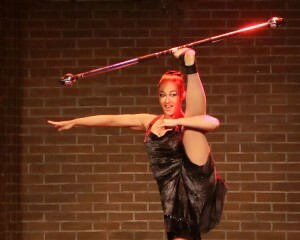 The Junior, Team, and Individual competitions were held on the same night, categories alternating with each act. Daniel Van Hoomissen and Kaito Tanioka competed in both Juniors and Teams. Marika Henrichon, director of Les Productions Episode, brought her interactive theater experience to the role of MC. Patrick Fraser of Ontario showed smooth and intriguing club work. It is said his interest in theoretical physics forms the basis for this introspective style. Fraser could go far with his experience in this event and his spatially mobile precision. Daniel Van Hoomissen, 15, this year’s bronze medalist in Juniors, ramped the entertainment from the start with a shoe juggle and three clubs. 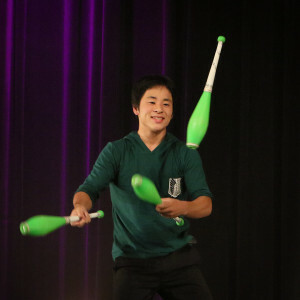 “My favorite tricks were a 97531 with five balls, a three-up with three clubs (that hit the curtain), and kicking my shoe into a four-club pattern.” He credited Kellin Quinn’s routine from last year for inspiration and Steven Brancel for convincing him to enter prelims. For music he chose Energy Drink by Ugly Duckling, and Creepin’ Up the Backstairs by the Fratellis. The song I’m single and I like it, along with 7 beanbags and rings, floated Max Poff to new levels of wackiness including a selfie. It’s always fun when competitors take performance risks and keep the tricks together. Poff, based in Cincinnati, Ohio, received a silver medal. Will this be the start of a Nizer-like competition career with evolving costumes and styles? Poff seems primed to spread happiness. The tux can wait. Delaney Bayles, 17, achieved fine form for her last year as a Juniors competitor to win the gold medal. 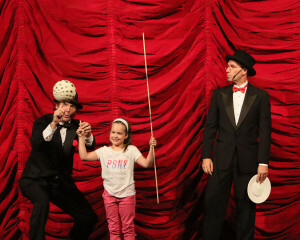 Her act included a set of her room complete with a portrait of juggling icon Doug Sayers. She woke as if from a dream to take on three yellow clubs with ease and security. Later this translated into flats. Five Sayers beanbags slid into continuous backcrosses. Her seven-ball run constituted a flawless pattern. Five and seven rings completed a well-rounded trio of objects no longer commonly seen in competitions. A four-club Mills backcross variation out of columns suited her symmetrical style. 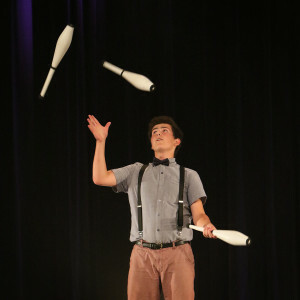 A past bronze medalist in the Juniors, Bayles has also made three joggling records and won the 2013 Juniors title at World Juggling Federation. 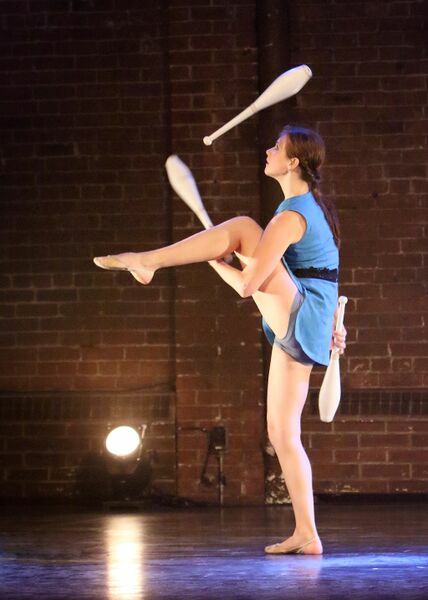 Bayles returned to the stage during the Cascade of Stars to accept the People’s Choice Award, a testament to her inspiration to others as a self-motivated technical juggler and to her performing experience. A native of Salt Lake City, Utah, she trained with Richard Kennison: “I visited Richard in St. Louis and I did perform with Circus Harmony at City Museum. It was great performing with the Arches. I really did enjoy the festival this year in Quebec.” So did her fans and maybe a future star will put up her photo. The Blingling Brothers, Paul Klaassan and Mark Williams, strutted casually to win third place in the Team Competition. Since meeting at a juggling prop shop in New Zealand they give the impression that everything happens offhand. Yet they won the Supreme Overall Award, New Zealand Circus Arts Award in 2013 so there has to be a method to their sunglasses and bling attire. Their enjoyment of the IJA competition under pressure seemed infectious for the audience as they passed up to eight clubs and stayed in groove. The Jugheads of Edina, MN came with a mission to achieve complexity and harmony as a 16-person ensemble. Club swats off floor instigated passing rounds. Later the clubs didn’t always bounce but interceptions and Wally Walks by Reid Johnson, Sam Karschinia, Riga Moettus, and Laura Schroeder continued unabated even through a musical glitch. Seven club variations joined by Jacob Cowan and Danny Van Hoomissen had the crowd clapping along. Nice arm circles in the middle of a dropback line of some intricacy added artistic flair. Taylor Claeys and Maddie Rodbourne triangulated with ease. A drop-back Y pattern with three jugglers on each limb stood out. A run-around duo provided an effective contrast. Nick De Boom, Cole Dunbar, Max Schleck, Liam Thompson, and Chris Van Hoomisen created weavery. 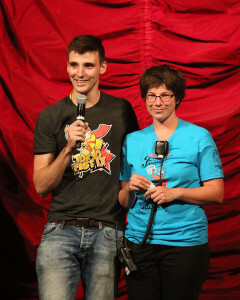 Steven Karschnia, Elise Johnson, and John Sticha took part in Turbo 5. The Jughead finale fit on stage. Chief Coordinator Paul Arenberg says they rehearse twice weekly but may develop smaller ensemble groups in future. A competitors’ survey revealed the Jugheads have participated in 20 IJAs (counting graduates) and prefer nutella to PNB. This year they won silver, which may put the IJA to produce “heavy medal” outlays. 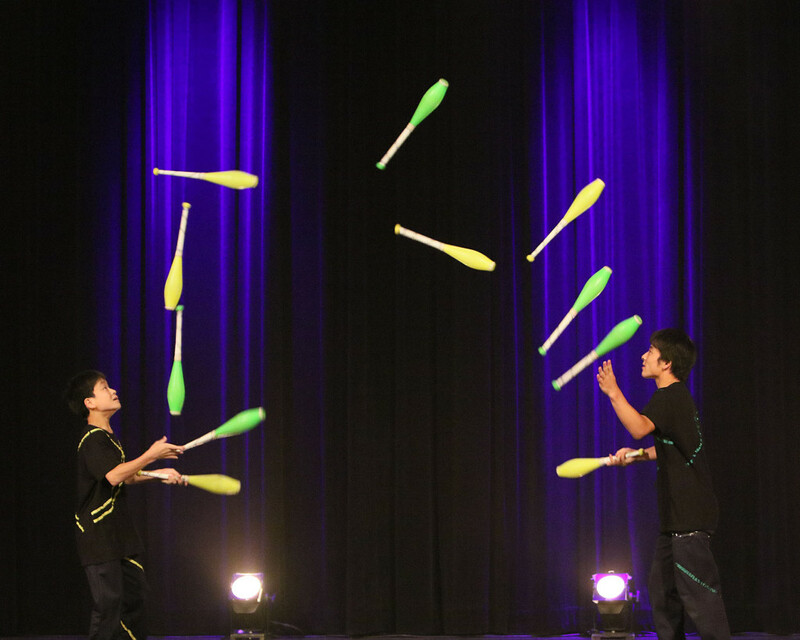 The Tanioka brothers, performing as Kentokaito, soared with ten-club passing smoothly accomplished out of a five-club pattern each. This routine had a focused rather than a flashy build-up. Five-club take-aways set the stage into seven clubs, singles rotating. What could have been target practice was aptly rescued with savoir-faire. The success of five and six clubs to an eleven-club pass made the duo perfectly happy. 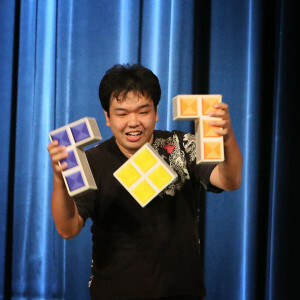 Kaito has competed in teams since very young, making him one of the younger champs in this all-age event. Kentokaito won gold medals and the distinctive IJA team trophy. The Individuals featured compelling artistry and great technique from all the competitors. Daisuke Hagiwara (Ryuan) of Shizuoka, site of the Daidogei Festival, opened the evening with good-natured ingenuity. 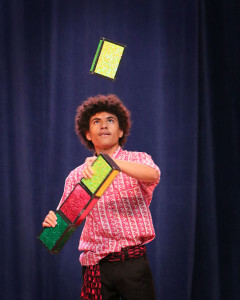 Using cigar boxes in the form of L shapes resembling the Tetris video game, he created a dexterous puzzle using like music. The isolation moves were not quite as effective as the tricks but his engaging style would cheer any audience. At the finale a clever device pulled the boxes down to disappear into his prop case. Hagiwara won the Indy Prop Contest for cigar boxes at the IJA in 2007 (using traditional boxes) and competed at the Japan Juggling Festival. 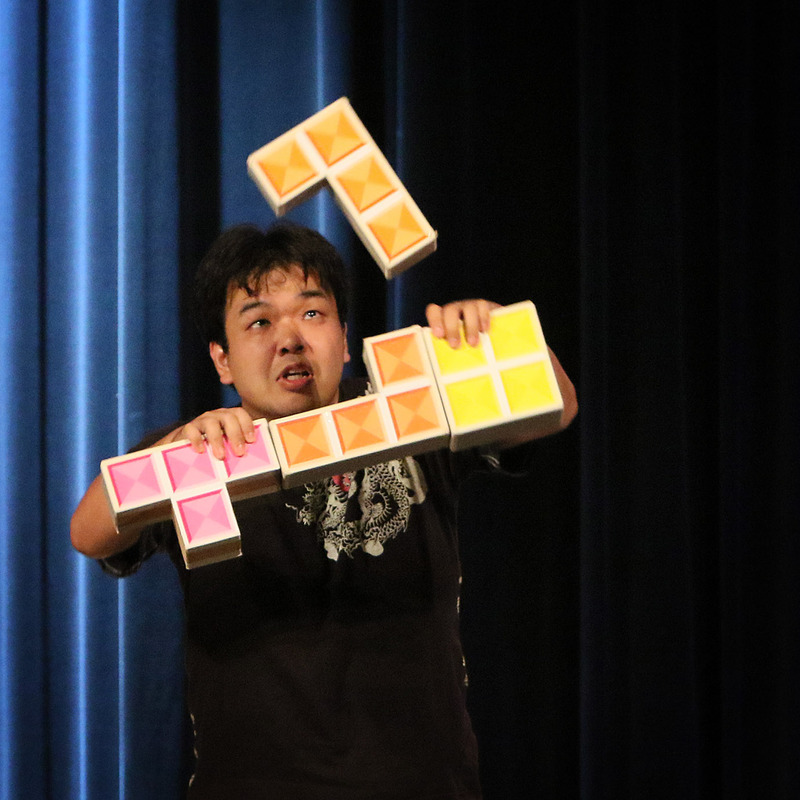 Kentaro Tsuchiya shared unusual tricks and brought in the audience in all he did. 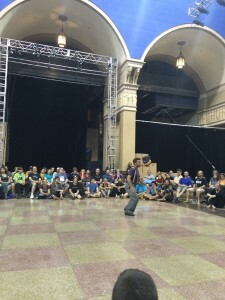 Appearing as an almost birdlike creature, he combined juggling and footbag techniques. This included 5-beanbag variations, clearly difficult and creative. The unexpected presentation added lighthearted verve and his sixth-place finish attested to the event’s overall excellence. Yu Kato competed with a lively box act, one of the few seen at this year’s festival. High throws increased the risk element of Kato’s box tricks. Individual bronze medalist Kento Tanioka’s easygoing manner belied his dramatic music and ambition with four and five clubs. Reverse backcrosses with three while facing upstage provided special dynamics and siteswap multiplex with five turned a pirouette. 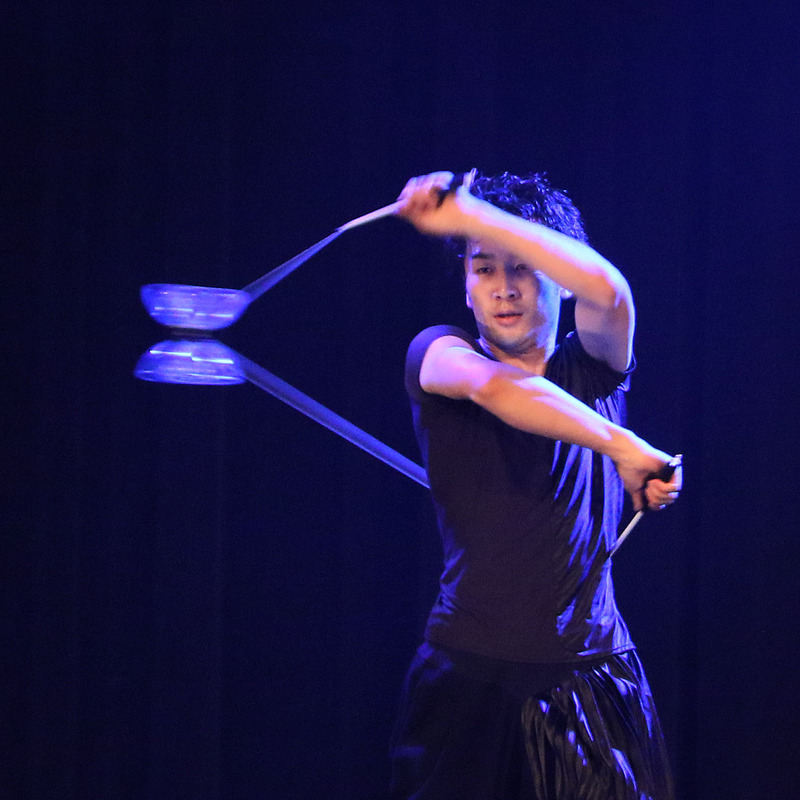 Yosuku Ubukata created intense yet free-flying diabolo choreography. He explained that his study of martial arts contributed to his technique and style. Creating at first a more studied series, he set the horizontal play free with beautiful accuracy and abandon. 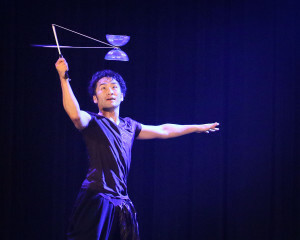 He won a silver medal in a year that diabolo topped the list of competition favorites and Ubukata intrigued the audience with his accomplishments and potential. 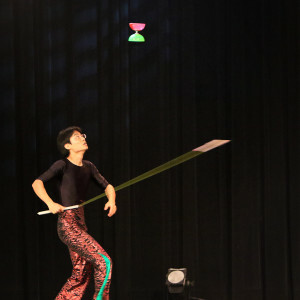 Yusaku Mochizuki, last year’s silver medalist and Japan’s national diabolo contest winner from 2004, played a dramatic, exuberant overture on a string to win the Lucas Cup. Having used light effectively in the past to create exciting pieces, Yusaku’s IJA routine glowed but relied more on maneuvers with gradually increasing numbers. Always entertaining, with varied style, he exhibited great control of shifting angles and directions, giving the choreography more possibility than the straight-on orientation. Tap dance and masterly changes of tempo enhanced the well-chosen tricks. 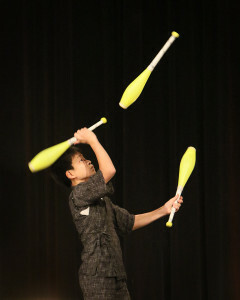 As a twice past medalist in the championships he came by the expression, “third time’s the charm,” a jugglers’ classic. 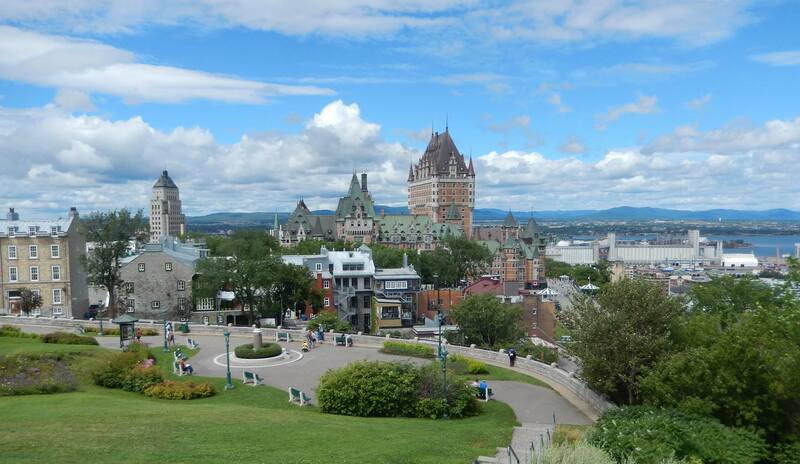 “I’m happy the IJA went International,” said Quebec organizer Veronique Provincher. 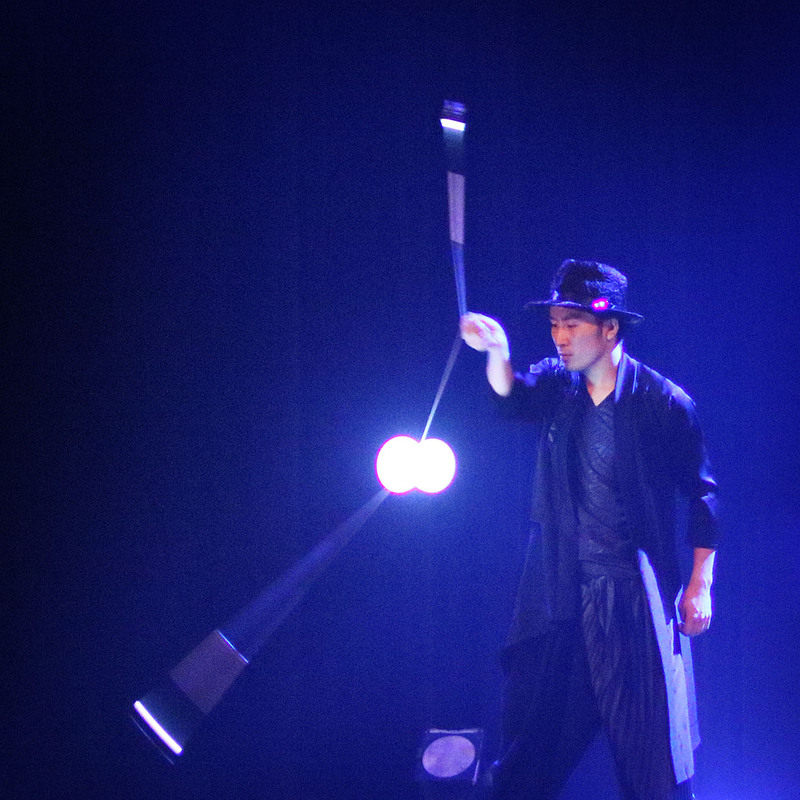 The Imperial Bell Theater made a grand setting just the size for the jugglers in attendance. 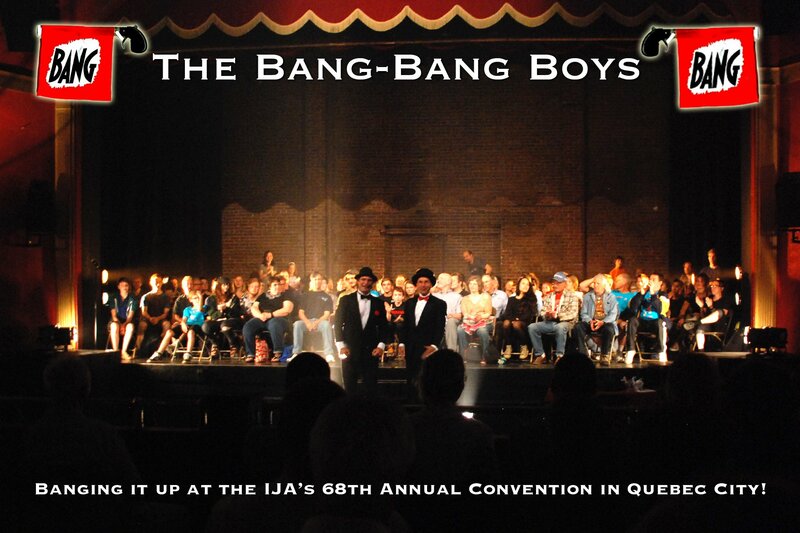 The Bang-Bang Boys, MCs David Aiken and Jean-Michael Pare, brought all together with consummate professionalism. Opening before the curtain with an old movie mystique they later appeared muppet-style to offer commentary from the box seats. The opening ensemble constituted an onstage pajama party, complete with a dude on toe shoes and comedic revelry. 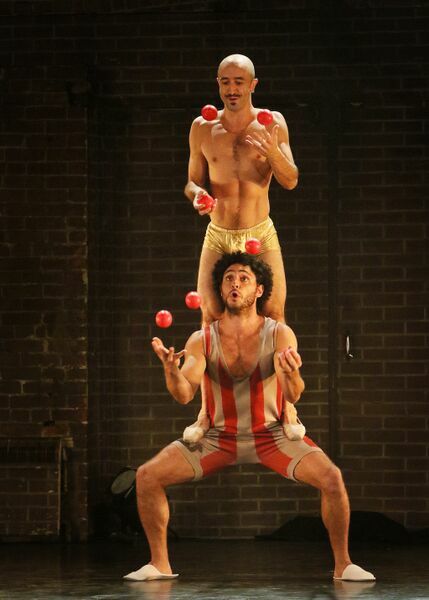 Marco Paoletti and David Menes bounced balls with expertise to set the scene. Julie Lavergne performed Cyr wheel with elegant lyricism. She has won international awards in China and Budapest and practices and performs a variety of circus arts including fabric. Jimmy Gonzales merged creativity with considerable artistic risk juggling clay. Objects could multiply or end up in a mask on his face. 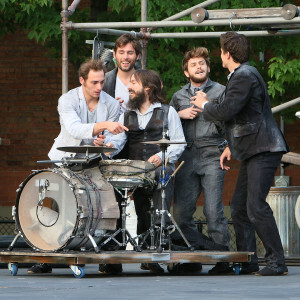 Gonzales’ commitment and soulfulness made this a contemporary circus act such as the Quebec organizers had hoped to include in the festival. The brick wall background added to the simple, earthy elements of the routine. Gonzales bonded with the clay to the point he could almost eat it. Solstix, Josh Dyffort and Valerie Sealey, performed their dynamic and integrative staff duet. 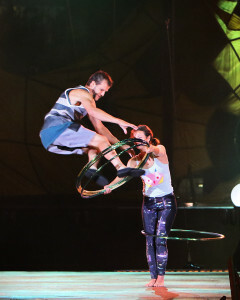 Circling each other, their often interlocking spin variations take the choreographic possibilities forward. Merlin Campbell from the Montreal area, attending his first IJA, took the Solstix staff workshop. He was part of a select group learning the first three techniques of Fei Cha, the Chinese form. This is different from European contact staff usually seen in shoulder rolls. The Solstix workshop was on my dream list. After their graceful, intense performance in the closing show, Solstix said they would return to Europe for gigs in the Netherlands and Hungary. 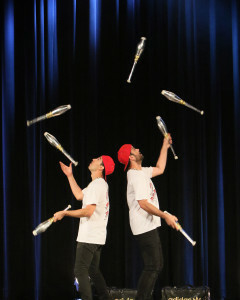 They called performing for jugglers exhilarating yet challenging. 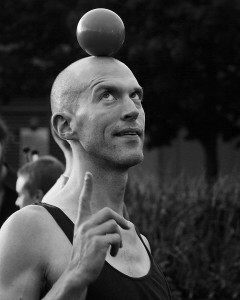 Jorge Petit also enjoyed recognition and response from jugglers for his vintage ball juggling act. 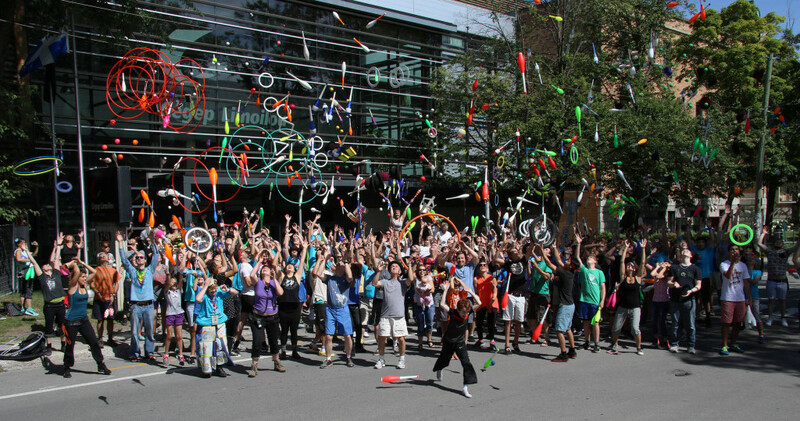 Stephane Gentilini of France transformed vaudeville hoop rolling to contemporary feasibility. 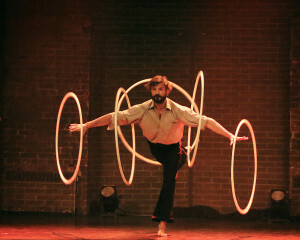 Using large hula hoop props, he capitalized on some of the classics while adding new elements like forward-facing rolls in the cascade and body spins of yore inside the pattern. 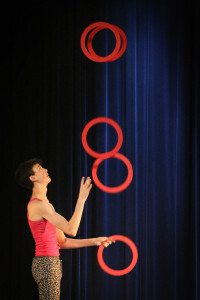 Jugglers enjoyed the technical innovations yet the act also had a burgeoning style of its own. 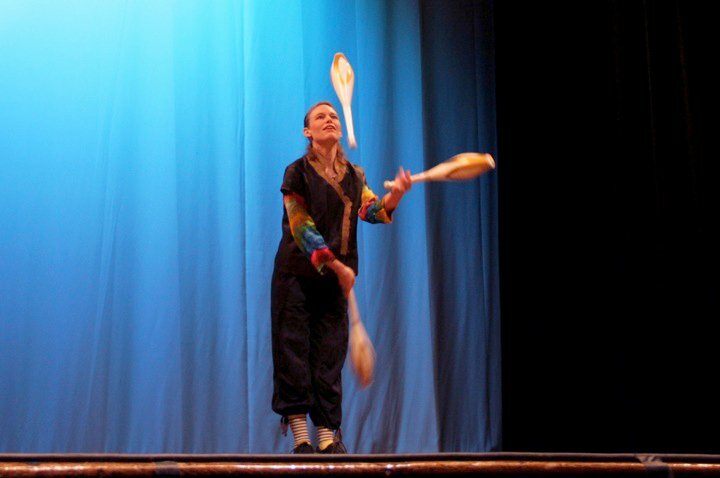 Svetlana Zueva has an unusual consulting job uniting juggling with rhythmic gymnastics. Not just in words; this was the major club act of the night and Zueva included a run of six. More notable than numbers were the variations which answered the question how to combine rhythmic maneuvers with club manipulations. Snaky flourishes, club rolling, and kick-ups plus extra flexibility and reverse traps helped. 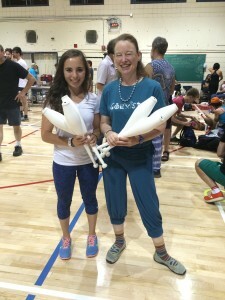 Zueva taught a special workshop and her club juggling wowed throughout the fest. 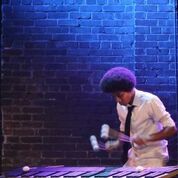 Bronker Lee teamed with Aaron Williams of Los Angeles, attending his first IJA as rhythmic percussionist. Off stage, they jammed in the hallway with Bill Barr. 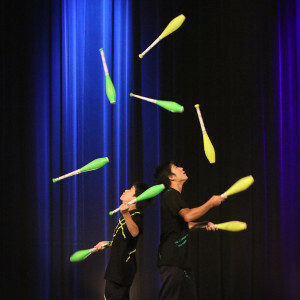 Their performance promised to bring variety to the public show, tapping into the connection between juggling, percussion, and movement arts. Lee’s experience as an entertainer created a memorable ball-bouncing set and Williams’ enthusiasm percolated throughout the festival. Tony Frebourg of France took to the stage for the finale after breaking a ninth world record earlier in the day. David Aiken said one of the highlights as MC involved the set-up for Frebourg’s act. The front section of the audience were invited to bring their chairs onstage creating a pit for an exceptionally high ceiling to enable four and even five diabolos on a string. Frebourg’s creative costuming and intense music added more than impressive numbers. Whether doing acrobatic splits while spinning multiple diabolos or playing zen wizard to their patterns Frebourg has always had a flair of his own. This marked an exciting finish to a show with many dimensions of manipulation and artistry. “The awards felt very American in how they were presented,” said Turbo Fest attendee Matthew Byng-Maddick, who came from England to his first IJA. The Bobby May Award for assistance to jugglers went to David Cain, a latter-day Ohio juggler, presented by his juggling brother Scott. Bobby Jule, subject of one of Cain’s articles, accepted the Historical Achievement Award, calling it the best day in his life at 90. A Pennsylvania native, Jule rose to stardom in the 1940s and created a ping pong ball balance widely adopted. Jule attended with his wife and shared his humor and knowledge of the art. David Cain’s own account of Jule’s life and art can be found in ejuggle. 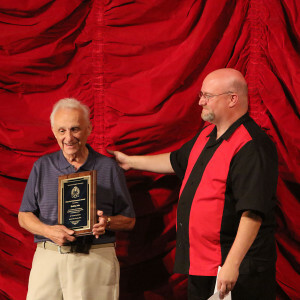 Charlie Frye accepted the Award of Excellence via a pre-taped video from his stage show. 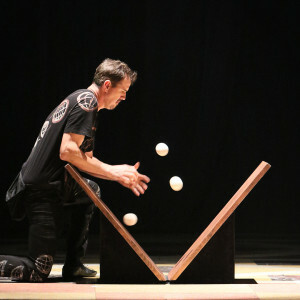 Frye also shared his tricky techniques in a longtime column in JUGGLE magazine. Erin Stephens received the Award for Extraordinary Service. She thrilled to the task of launching regional competitions for the IJA in Central and South America with events in Mexico, Costa Rica and Peru. The conventions have become quite popular, though Stephens notes perennial talent less known in North America. Stephens also served as an IJA board member. 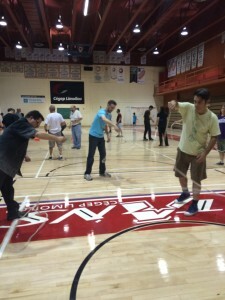 Nathan Wakefield, Martin Frost and Noel Ye were among the on-site organizers. 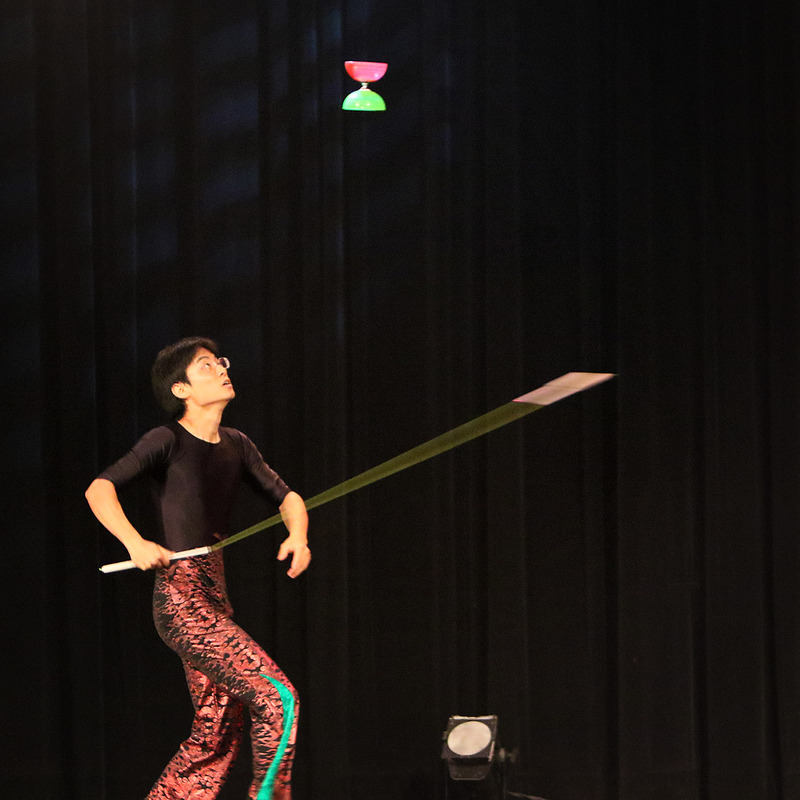 As Tony Freborg’s 3-diabolo start reminded, jugglers gravitate towards pyramids. The IJA’s Texas adventure will have a Latin flavor, Stephens predicts. 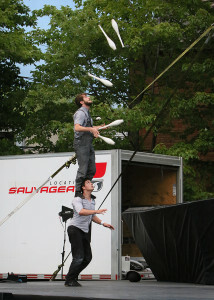 After the Quebec festival ended it rained en cue, clearing for lingering jugglers to catch Flip FabriQue at sunset. Here’s to the 2016 IJA in El Paso next summer (details here). I must’ve missed that: what are the new rules?